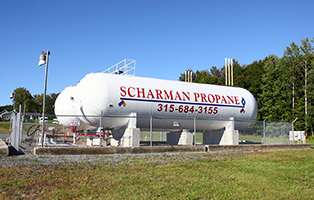 For more than 50 years, New Yorkers have relied on Scharman Propane and gas for their residential, industrial and commercial propane and gas needs. Scharman Propane and Gas is a locally owned and operated, full service propane store featuring the finest products, technicians and services in the area. Our commitment is to deliver safe, dependable propane services and products. Our products include, fireplace inserts, gas log sets, indoor/outdoor heaters, water-heaters, grills, ranges and refrigerators. Whether you are an individual or enterprise, Scharman Propane is an industry leader that offers unmatched service and quality to our customers statewide. Are you ready to start enjoying the benefits of propane? Propane’s exceptional value makes it the choice for millions for American for their homes, farms and fleets. If you are new to propane or unfamiliar with its benefits, please view our “Why Propane?” area. One of Scharman Propane's Storage Tank Facilities which provide propane gas for the area customers.